Can you identify Mike Sisco? I have an analytical challenge for you. Can you pick me out of the baseball team photo from my youth? Take a close look at the photo, decide, and answer the poll before you scroll down to see the answer. Take a guess in the poll and we will see how many get it. Three clues follow to help you zone in on me. Click on the image for a closer view. First of all, , , a current photo of me is in the right-hand panel of this page, , , it should help you find me on the team photo. Surely, I haven’t changed that much in 49 years. Got another surprise for you. My brother, Larry, who is 11 months younger than me is also in the team photo and there is one player sitting between us. Need another tip? I’m wearing a baseball cap and Larry isn’t. This should give you the answer. Make your best guess in the poll above before scrolling down to see the answer. I’m really interested to see how good your analytical skills are. I’ve had people stop me in an elevator, , , in the airport, , , and in a hotel and ask me if I was “Mike Sisco”. It usually catches me off guard until I learn they are headed to the same meeting as I am. Got your answer submitted yet? The answer is below, , , answer the poll before looking, , , no peeking! 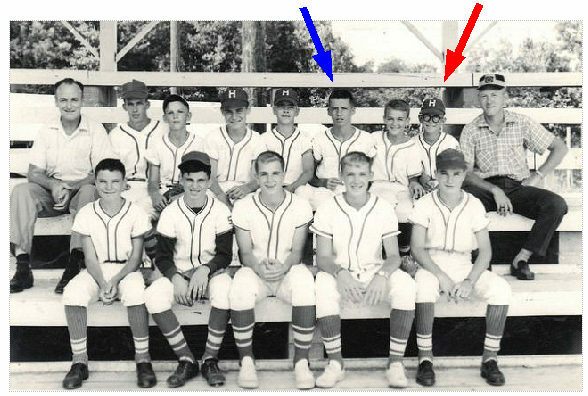 The red arrow points to me and the blue arrow points to my brother, Larry. I was a little guy as you can see but made up for it by hustling and working harder than the bigger guys. Even my brother who is a year younger always seemed bigger than me. Larry is driving up from Florida to visit for a couple of days and thought he might enjoy this photo so I printed it and others I received from an old friend to give him. Terry Jones made these available and is the guy sitting between Larry and me. This entry was posted in Just for FUN !! 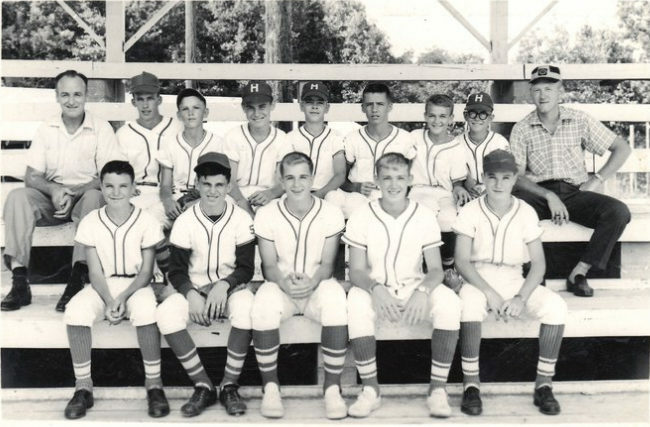 and tagged baseball photo, larry sisco, lewis county baseball team, little league, mike sisco. Bookmark the permalink.